What Does Code P0300 Mean? OBD II fault code P0300 is a generic code that is defined as “Random/Multiple Cylinder Misfire Detected”, and is set when the PCM (Powertrain Control Module) detects either randomly misfiring cylinders, or misfires on multiple cylinders. All modern applications employ highly sophisticated circuits whose sole purpose is to detect misfires. In fully functional systems, the misfire detection system uses input data that is delivered to the PCM via dedicated feedback circuits that let the PCM “know” whether or not a particular component such as spark plug or fuel injector had not only received a triggering signal, but also if the sparkplug or fuel injector had reacted to that triggering signal. If the PCM does not receive a feedback signal, it interprets the lack of that signal as a misfire. However, some conditions, such as low fuel pressure or engine vacuum leaks can cause random misfires without the feedback signal from injectors and/or sparkplugs necessarily being affected, but in these cases, the underlying cause of the misfires will be indicated by dedicated fuel system and other codes that will be stored alongside P0300. Non-professional mechanics should therefore note that while P0300 is a generic code, the actual root cause(s) of the code is often make-and-model specific. Nonetheless, while P0300 refers to faults in the ignition system, misfires, and especially random misfires, are often caused by faults that may not be directly related to the ignition system. Note that if the fault does involve the ignition system, the resulting code(s) will end in digits other than” 0”. For instance, if the misfire occurs on cylinder #4, the code indicating this will be P0304, where the “4” relates directly to the affected cylinder. Similarly, misfires that occur repeatedly on specific cylinders will set codes that end with the numbers of the misfiring cylinders as the last digit in the codes. Where is the P0300 sensor located? Since code P0300 has many and varied possible causes, it is not possible to provide detailed information on the location of every part or component that can fail on all applications. However, on most applications, the most likely causes involve sparkplugs, coils or coil packs, or wiring that are easily accessible if the protective shields are removed that cover most modern engines. However, since some protective shields are somewhat akin to jigsaw puzzles, it is always a good idea to refer to the manual for details on how to remove them, since in many cases retaining clips and screws are not always located in obvious places. What are the common causes of code P0300? What are the symptoms of code P0300? Depending on the application and the nature of the problem, multiple misfire-related codes may be present as well. Note that in some cases, codes that are (seemingly) not related to misfires may be present. What are common solutions to code P0300? How serious is code P0300? Code P0300 should be considered serious, since the engine could shut off unexpectedly. In some cases, fatal damage to the catalytic converter(s) can occur if code P0300 is not resolved in timely manner. How safe is it to still drive the car with code P0300? Ideally, the vehicle should not be driven while code P0300 is present, and especially not in traffic since the vehicle could be immobilized unexpectedly should the engine shut off. Note that should the engine shut off, there is a more than even chance that it could not be started again. This possibility poses an obvious risk to life and limb should the vehicle be immobilized in fast-moving traffic. How difficult is it to repair code P0300? Non-professional mechanics should note that while P0300 is one of the most commonly occurring codes, it is also often one of the most difficult codes to diagnose/repair because the code does not identify the probable cause(s) of the misfire. Therefore, repairing this code could range from easy if the cause is obvious, such as a split or dislodged vacuum hose, to extremely challenging if the cause involves malfunctioning sensors, defective control modules, or intermittent wiring issues that affect the operation of sparkplugs or fuel injectors. Note also that diagnosing/repairing this code should NOT be attempted unless a scanner is available that can monitor live data streams. In many instances of this code, it is necessary to monitor operation of sensors such as the MAP (Manifold Absolute Pressure) and MAF (Mass Airflow Flow) sensors (among others) to either confirm, or eliminate a particular sensor as the probable cause of the code. Thus, if suitable diagnostic equipment, a repair manual for the affected application, a good quality digital multimeter, and a comprehensive tool set (that includes a fuel pressure gauge) are not available, the better option is to refer the vehicle to the dealer or other competent repair facility for professional diagnosis and repair. What are the common mistakes when repairing code P0300? Expensive ignition and fuel system parts and components are often replaced in error or desperation when the real cause is more often than not poor electrical connections in one or more wiring harnesses. Note that while control module failures are not altogether impossible, no control module should be replaced until and unless all other (and more likely) causes of this code have been investigated. How do you troubleshoot code P0300? NOTE #1: Take note that neither valve timing, nor ignition timing is likely to be the cause of random misfires, and especially on applications that have distributor-less ignition systems. Although there are exceptions, valve timing issues will generally produce consistent misfires on one or more (or more commonly, on all) cylinders, as will failures of the circuits in the PCM that control ignition timing. Also note that it can happen for this code to present even though there are no discernable symptoms. In these cases, simply clear the code and operate the vehicle normally for a few miles to see if the code returns. If the code does not return, it is likely that it had set as the result of a “glitch” in a control or feedback circuit. NOTE#2: Poor routine maintenance and servicing is arguably the most common cause of code P0300. Thus, before starting a diagnostic procedure for this code, remove and inspect all sparkplugs. Look for signs of contamination, oil/carbon fouling, and/or excessively worn electrodes. 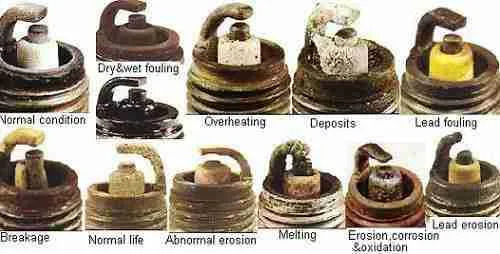 Refer to the image below to diagnose common sparkplug issues. Note however that sparkplugs must ONLY be replaced by the sparkplugs that are recommended by the manufacturer. Installing incorrect sparkplugs will almost certainly result in a recurrence of the problem within a few hundred miles. NOTE #3: Note that low fuel pressure, or other conditions that cause a lean fuel mixture can cause sparkplugs to overheat and fail intermittently, which will also cause code P0300. If a lean running condition is identified through an inspection of the sparkplugs, verify the condition by scanning specifically for low fuel pressure codes, and resolve these codes and their causes before continuing this diagnostic procedure. Use a dedicated fuel pressure gauge as per the instructions in the manual to either confirm, or eliminate low fuel pressure as a probable cause of code P0300. NOTE#4: Note that engine vacuum leaks that allow unmetered air to enter the engine are another common cause of this code. It is therefore imperative that an engine vacuum system diagram as well as a graduated vacuum gauge be available when diagnosing this code. NOTE #5: While poor engine compression can cause misfires, it usually happens only on one cylinder for various reasons, or more commonly on two adjacent cylinders when a cylinder head gasket blows, which condition is almost always indicated by specific symptoms such as severe engine overheating. It is highly unlikely (but not altogether impossible) that all cylinders will be affected by poor compression, but if it does happen, the possible repair options could include rebuilding or replacing the engine. NOTE: If other codes are present, and especially fuel system and other misfire related codes, note the order in which they were stored. Codes that precede P0300 MUST be investigated and resolved in the order in which they stored. Failure to do this will result in a misdiagnosis, wasted time, and the unnecessary replacement of parts and components. If no other codes are present, start the diagnostic procedure by performing a thorough visual inspection of the ENTIRE engine vacuum system. Look for split, cracked, dislodged, or otherwise damaged vacuum lines and hoses, and pay particular attention to all attachment points, since air may leak past a junction or attachment point if the hose is hardened due to old age. Replace all vacuum lines and hoses that are in a less than perfect condition. NOTE: Pay particular attention to vacuum lines that control the operation of the EGR (Exhaust Gas Recirculation) valve, as well as the lines that control turbo boost, since failures of these vacuum sub-systems can cause random misfires when these failures affect turbo boost or EGR valve operation. Note however that EGR or turbo boost issues will almost certainly be indicated by dedicated codes, which is why careful note MUST be taken of the order in which additional codes were stored. Clear all codes after all repairs to the vacuum system are complete, and operate the vehicle for at least one complete drive cycle to see if the code returns. If the fault persists but it is certain that the engine vacuum system and sparkplugs are in perfect working condition, perform a thorough visual inspection of ALL wiring that is associated with both the ignition system and the fuel system, and particularly the wiring that controls the fuel injectors. Look for damaged, burnt, shorted, disconnected, or corroded wiring and/or connectors. NOTE: Pay particular attention to connectors. Pull all connectors apart and inspect BOTH halves for signs of corrosion, overheating, or damaged pins/terminals. Overheating of a connector is a sure sign of a poor contact, so be sure to inspect ALL connectors, and replace any that are corroded, or otherwise in a less than perfect condition. If no visible damage is found, refer to the manual to determine the correct procedure to follow to perform resistance, ground integrity, and continuity on ALL associated wiring. Compare all obtained readings with the values stated in the manual, and make repairs or replace wiring/connectors as required to ensure that all electrical values fall within the ranges specified by the manufacturer. NOTE: Bear in mind that a failed injector or sparkplug will produce a consistent misfire on the affected cylinder, so the object of this step is to try and identify a wiring issue that will affect more than one (or all) cylinders. Typical problems include loose or defective connectors on coil packs, or defects such as cracked insulation on wiring that control the fuel injectors. WARNING: DO NOT disable sparkplugs or disconnect pencil (individual ignition) coils while the engine is running to induce a misfire in an attempt to diagnose the problem. Doing this will allow raw fuel to enter the catalytic converter(s), which could result in the converter(s) melting in as few as ten seconds or less as a result of the un-burnt fuel igniting in the converter(s). If all of the above tests and checks fail to resolve the problem, suspect a leaking inlet manifold gasket that allows unmetered air to enter the engine. Note however that in most cases, removing an inlet manifold to inspect a gasket or seal could involve removal or disassembly of many unrelated components. If a leaking manifold gasket is suspected, bear in mind that removal and re-installation almost always requires tools, equipment, and skills that many, if not most non-professional mechanics do not possess. In practice, this means that if a leaking manifold is suspected, the better option is often to refer the vehicle to the dealer or other competent repair facility for professional diagnosis and repair. NOTE: One possible way to identify vacuum leaks around an inlet manifold is to spray a NON-FLAMMABLE aerosol spray onto mating surfaces while the engine in running. Note however that this is not a foolproof method, but if the spray reaches the site of the leak, the way the engine idles will change as the leak is temporarily plugged with the spray. This method can also be used to identify leaks in cases where many vacuum hoses are arranged so closely together that it prevents easy inspection of each individual line or hose. There are no codes that are directly related to code P0300 – “Random/Multiple Cylinder Misfire Detected”. NOTE#1: It is sometimes easy for non-professional mechanics to confuse P0300 with codes P0301 through P0312, which all refer to consistent misfires on a specific cylinder. While one or more of the codes P0301 through P0312 can sometimes contribute to the setting of P0300, specific misfire codes will almost always precede P0300 in the diagnostic fault memory, which means that resolving specific misfire codes will often resolve P0300 as well. NOTE #2: Also note that code P0313 – “Misfire Detected with Low Fuel” is NOT related to P0300 since P0313 has a very specific cause, which is not the case with P0300. What vehicle are you running? How was it running before you did the tune-up? Some vehicles don’t like aftermarket spark plugs or even certain branded spark plugs – did you use properly-gapped spark plugs recommended by the manufacturer? Does it run fine when cold and then go wonky when it gets hot? Are the spark plug wires or coils in good condition? If you have an EGR, how does the car run if you disconnect it? You could try rapping on the EGR with a hammer to see if it’ll close – maybe stuck open. I know that misfire codes can be difficult to address. Try and go through the article one step at a time and you should come across the fault. this code come when engine is cold.